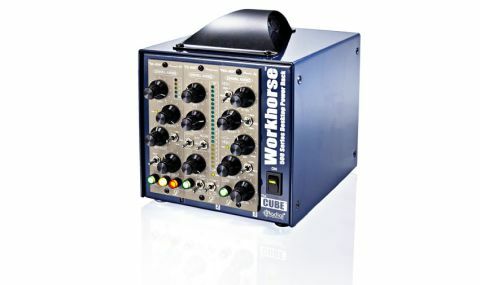 A useable 500 series module at an attractive price point that will find favour among professionals already sold on the 500 rack concept. Won't quite replace a Pultec. Lindell Audio has only been around since 2010 but by heading into the 500 series arena with the PEX-500 (a Pultec-style Equaliser), this company is entering a market with some heavy-weight competitors. Character and quality count, and fortunately this unit has both of those things in spades. First things first, this module looks good. The front panel has a pleasing style and the knobs and switches feel classy. With the 500 modules' small size, things have to be compact and Lindell has packed it in without losing clarity or logic of layout. "While it may seem odd basing a solid state design on a valve classic, it actually makes sense"
Software emulating old bits of valve kit is a familiar concept. While it may seem odd basing a solid state design on a valve classic, it actually makes sense. In the same way that Pultec and Lindell's offerings have gone to great lengths to offer the same switchable frequency bands as the originals, this is a passive design using inductors. The HF, however, only has three bands whereas the Pultec has seven. Those details allow the PEX to operate in a remarkably similar way to its inspiration, and the interaction of the cut and boost circuits does what you would expect. As with a Pultec, when you apply equal amounts of cut and boost in the bass end you get a peak at the selected frequency instead of the anticipated cancelling. In the high end this translates to a shelved boost shape changed by the amount and frequency of the 'Atten' controls. While this wont replace a Pultec, it more than nods to its tone shaping abilities and sweet-sounding high end. We tried out the module on a wide range of sources within both tracking and mixing sessions and found that the PEX has that sweet but powerful top you would demand from anything claiming the revered Pultec heritage, while the lows are satisfyingly punchy and solid. In a nutshell, Lindell has succeeded in making a useable 500 series module that will find favour among professionals already sold on the 500 rack concept. Add to that the price point and it becomes an attractive prospect - you could easily set yourself up with a three-module lunchbox for less than a grand.